This Saturday night Adelaide based Sprintcar Team Gates Motorsport will team up with Chad Ely for the running of the 2019 South Australian Sprintcar Title at the Whyalla Speedway. This season regular team driver Tregan Gates has been gaining some valuable seat time in the 410ci ranks after several seasons in the 360ci class, including contesting the first three nights of the Speedweek tour along with selected USC events, but the team believes its best chance of a result this weekend will be with Ely behind the wheel of the #5 CraneWorx Maxim. Chad, a former Australian and South Australian 360ci Champion, has had a busy season driving for both Max Bell and Jamie Stark taking in events throughout South Australia and Victoria, but he has proven that he has what it takes to compete with the best. 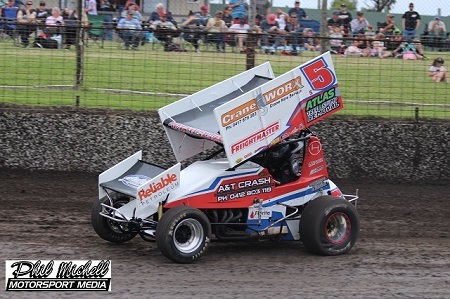 “Chad is one of the smoothest operators in Sprintcar racing and the Gates Motorsport team are privileged to have him jump into the seat for a significant Sa race” added regular driver Tregan Gates. “Lets hope that the local Sprintcar fans head up there to support the Whyalla Speedway, Chad and the Gates Motorsport team to witness what should be a great event” he added. CraneWorx, Freightmaster, A&T Crash, The Exchange Hotel, Pinnicle Graffix, Reliable Petroleum, Steve Wickes Powder Coaters, Atlas Tree & Stump Removal, ECS Mechanical, Universal Metal Cleaners, Maxwill Race Engines, Highside, Phil Michell Motorsport Media, Adelaide Wear Parts, Whyalla Earthworks.